This section shows how to use the Tomcat cookbook to implement a basic stack setup that runs a simple Java server pages (JSP) application named SimpleJSP. The stack consists of a Tomcat-based custom layer named TomCustom and a MySQL layer. SimpleJSP is deployed to TomCustom and displays some information from the MySQL database. If you are not already familiar with the basics of how to use AWS OpsWorks Stacks, you should first read Getting Started with Chef 11 Linux Stacks. The SimpleJSP application demonstrates the basics of how to set up a database connection and retrieve data from the stack's MySQL database. The root namespace, java, which is separated from the rest of the name by a colon (:). Any additional namespaces, separated by forward slashes (/). Tomcat automatically adds resources to the comp/env namespace. The resource name, which is defined in the web app context configuration file and separated from the namespaces by a forward slash. The resource name for this example is jdbc/mydb. Calls the DataSource object's getConnection method, which returns a Connection object. Calls the Connection object's createStatement method to create a Statement object, which you use to communicate with the database. Communicates with the database by calling the appropriate Statement method. SimpleJSP calls executeQuery to execute a SHOW DATABASES query, which lists the server's databases. The executeQuery method returns a ResultSet object, which contains the query results. SimpleJSP gets the database names from the returned ResultSet object and concatenates them to create an output string. Finally, the example closes the ResultSet, Statement, and Connection objects. For more information about JSP and JDBC, see JavaServer Pages Technology and JDBC Basics, respectively. To use SimpleJSP with a stack, you must put it in a repository. You can use any of the supported repositories, but to use SimpleJSP with the example stack discussed in the following section, you must put it in a public S3 archive. For information on how to use the other standard repositories, see Cookbook Repositories. Copy the example code to a file named simplejsp.jsp and put the file in a directory named simplejsp. Create a .zip archive of the simplejsp directory. Create a public Amazon S3 bucket, upload simplejsp.zip to the bucket, and make the file public. For a description of how to perform this task, see Get Started With Amazon Simple Storage Service. To run SimpleJSP you need a stack with the following layers. A MySQL layer, that supports the back end MySQL server. A custom layer that uses the Tomcat cookbook to support Tomcat server instances. On the AWS OpsWorks Stacks dashboard, click Add Stack to create a new stack and click Advanced >> to display all options. Configure the stack as follows. Name–A user-defined stack name; this example uses TomStack. Use custom Chef cookbooks–Set the toggle to Yes, which displays some additional options. For the remaining options, you can accept the defaults. Overrides the Tomcat cookbook's ['base_version'] attribute to set the Tomcat version to 7; the default value is 6. Overrides the Tomcat cookbook's ['java_opts'] attribute to specify that the instance is headless and set the JVM maximum heap size to 256MB; the default value sets no options for instances running Amazon Linux. Specifies the ['datasources] attribute value, which assigns a JDBC resource name (jdbc/mydb) to the web app context name (ROOT), as discussed in tomcat::context. This last attribute has no default value; you must set it with custom JSON. Click Add a layer. For Layer type, select MySQL. Then click Add Layer. Click Instances in the navigation pane and then click Add an instance. Click Add Instance to accept the defaults. On the line for the instance, click start. Return to the Layers page and click + Layer to add a layer. For Layer type, click Custom.s The example uses TomCustom and tomcustom as the layer's name and short name, respectively. For Setup, type tomcat::setup and click +. For Configure, type tomcat::configure and click +. For Deploy, type tomcat::deploy and click +. Then click Save. Name–The app's name; the example uses SimpleJSP and the short name generated by AWS OpsWorks Stacks will be simplejsp. App type–Set this option to Other. AWS OpsWorks Stacks automatically deploys standard app types to the associated server instances. 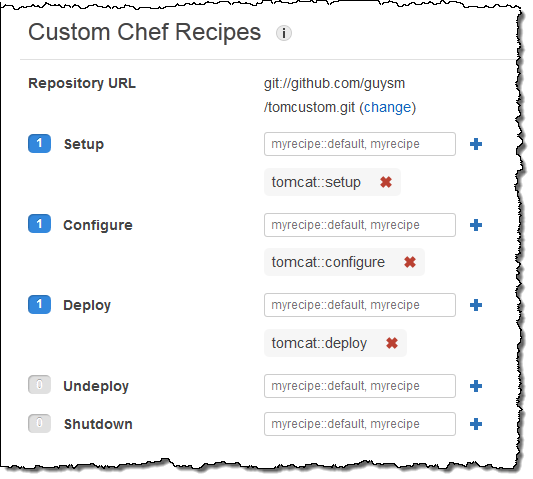 If you set App type to other, AWS OpsWorks Stacks simply runs the Deploy recipes, and lets them handle deployment. Document root–Set this option to ROOT. The Document root value specifies the context name. Repository type–Set this option to S3 Archive. 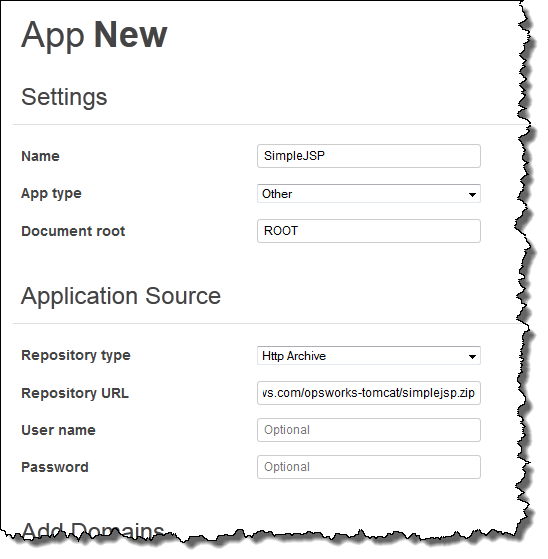 Repository URL–Set this to the app's Amazon S3 URL that you created earlier. Use default settings for the other options. Use the Instances page to add an instance to the TomCustom layer and start it. AWS OpsWorks Stacks automatically runs the Deploy recipes on a new instance after the Setup recipes complete, so starting the instance also deploys SimpleJSP. When the TomCustom instance is online, click the instance name on the Instances page to see its details. Copy the public IP address. Then construct a URL as follows: http://publicIP/tc/appname.jsp. For the example, this URL will look something like http://50.218.191.172/tc/simplejsp.jsp. The Apache URL that forwards requests to Tomcat is set to the default ['tomcat']['apache_tomcat_bind_path'] attribute, /tc/. The SimpleJSP document root is set to ROOT which is a special value that resolves to /. The URL is therefore ".../tc/simplejsp.jsp". If your stack has a MySQL instance, AWS OpsWorks Stacks automatically creates a database for each app, named with the app's short name.